As we envisaged in our August outlook, the low-interest rates continued through the summer. Despite two short-lived hikes, rates stuck close to their lows of the last year (0,3%). Note: the graph has the market rate (yield) on the 10 year Bund. This is the benchmark interest rate, which drives the prices for the 10-year fix rate mortgages—add about a percentage point and you get the rate available to the best borrowers. 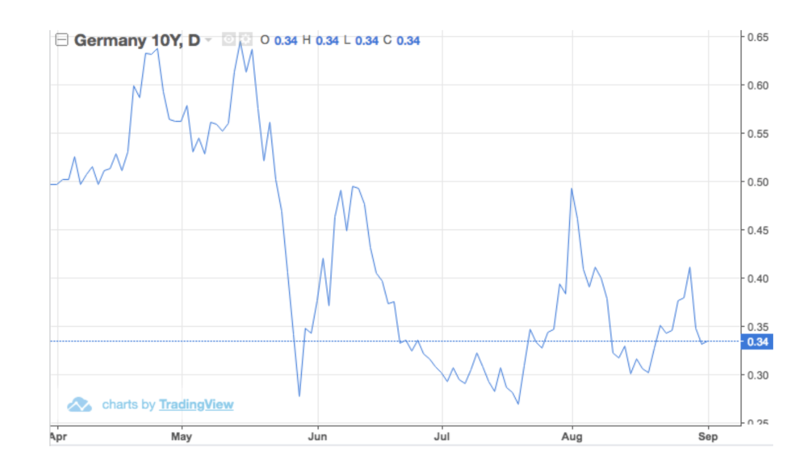 The main reason for the subdued rates is that the forthcoming congressional elections in America and a mounting trade war with China have put a quite a damper on business confidence. Hence investment and demand for borrowing have been slow. Meek wage growth across Europe and the US has not fueled the confidence of consumers and loan demand either. 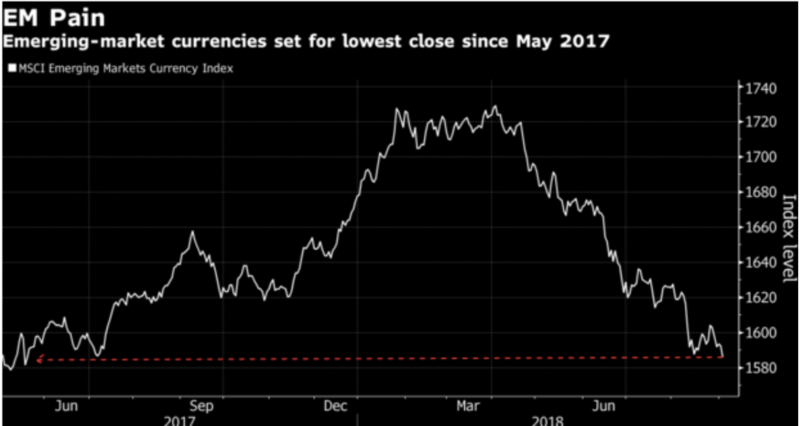 On top of Brexit uncertainties and a fiscally whacky government in Italy, that we stressed before, Europe has now another problem on its doorstep: Turkey. President Erdogan has made the central bank kowtow to his wishes, and hence markets expect inflation to balloon. As a result, the Turkish Lira went into a free fall as no one trusts the central bank or government economic policies anymore. The most worrisome aspect is that the crisis has spread to other emerging market economies, ranging from South Africa to Argentina and Indonesia. This is definitely putting another damper on world confidence. Across the ocean, the big new event was that President Trump took a leave from Erdogan’s book. Trump too has been trying to tell the Federal Reserve (the US central bank) that interest rates are too high and hence the dollar took a step back. Of course, there are many more safeguards in the US to ensure the independence of the Federal Reserve, but it is quite a worrisome break with a very long history of leaving the FED alone. And frankly, it may be a prelude of things to come: more interference with the FED, for example through nominations, and in particular more dollar manipulation. This too can put a damper on world confidence. We expect the doldrums to continue a bit longer, and hence no decisive move in interest rates. We don't see a resolution of the trade war until close to the US elections in November. Following those elections, we see two types of outcomes: a democratic majority with an upsurge in nasty political rhetoric and investor concern about a sharp shift towards the left, or a surprise victory of Republicans with more Trumpian business/growth optimism. Both can actually trigger higher interest rates, one because of fear for eventual higher government spending, the other triggering the expectation of more business spending. In Europe in the meantime, inflation has risen to 2%, the trigger point for the ECB to raise rates. Still, we expect bond and mortgage rates to stay subdued for at least a few more months: core inflation is still subdued at about 1,4% (this excludes petrol and food prices that have not risen a lot lately), while the various concerns (European centric and worldwide) put a damper on growth. However, once the expectations of growth reemerge, interest rates are set to rise and gradually make up some of the large (over 2%) difference with dollar interest rates. Bottom line: Watch for fireworks closer to or in November, with interest risks on the upside.